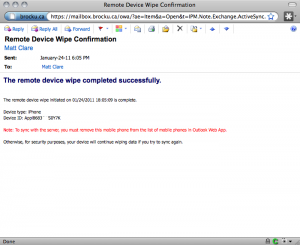 If you’ve ever wondered what happens when you wipe an iPhone via MS Exchange here’s my video. 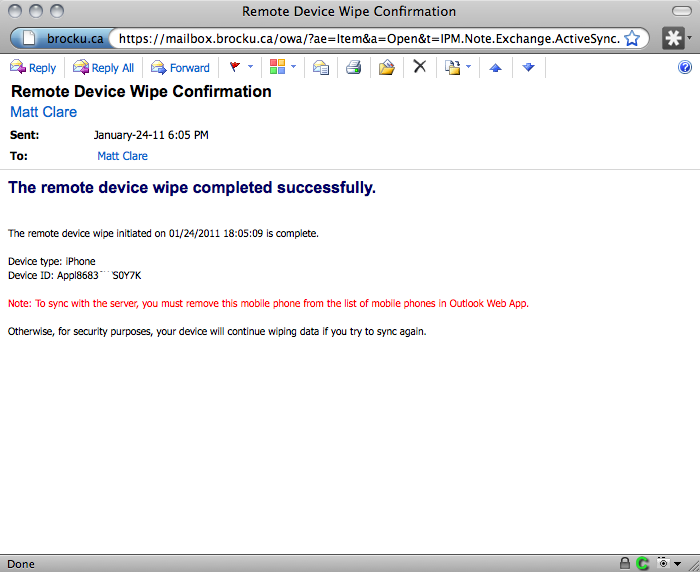 I hope you don’t find yourself in a situation where you need to wipe your MS Exchange linked iPhone because you lost it or it was stollen, but I think everyone who has their phone connected to Exchange at work or Apple’s MobileMe service appreciates this kind of piece of mind. I know I really value knowing that if someone’s got my phone they at least don’t have my data like E-Mails, contacts, pictures and whatever else is on my most personal device. In the case of MS Exchange 2010 here is what the confirmation E-Mail looks like afterwards. If you don’t have your phone linked to Apple’s MobileMe service I’d recommend the Exchange based options that you might have through work (or a BlackBerry Enterprise server) or Microsoft’s hosted Exchange services or Google’s Apps for domains premium services. The Conservative party’s take on Copyright reform, Bill C-32, is working its way through the parliamentary process. The last two copyright reform bills in Canada have died on the order paper, so it’s about time we revisit copyright as the Conservative government looks long in the tooth. In order for briefs on Bill C-32 to be considered by the Committee in a timely fashion, the document should be submitted to the Committeeâ€™s mailbox at [email protected] by the end of January, 2011. A brief which is longer than 5 pages should be accompanied by a 1 page executive summary and in any event should not exceed 10 pages in length. I couldn’t write that much, but I thought I’d take an other opportunity to send my thoughts on the need for an educational take on fair dealing (fair use) that deals with only who has access and not how (dead trees versus electrons) and doesn’t suggest that anyone should help enforce a company’s “digital lock”. Here’s what I’ve sent to my MP and modified for the committee. I encourage you to send something similar to your member or parlament and perhaps to the committee. I am writing you with respect to Bill C-32, Canada’s copyright reform bill. I want to urge you to help ensure a fair approach to Canadian copyright works used in education and that respects the rights of those who purchase copies of copyrighted works. I would further urge you to ensure that the Canadian government does not create a copyright regime that centres around fundamentally flawed concepts and technologies that create “digital locks”. This type of approach is no more appropriate than when politicians first tried to control access to the printing press. The convoy hauling six giant beer vats passed our house. You can follow twitter.com/ChallengerMF to track their progress. This was one of my first attempts at night photography with the DSLR. You are currently browsing the iMatt :: The Blog of Matt Clare weblog archives for January, 2011 .